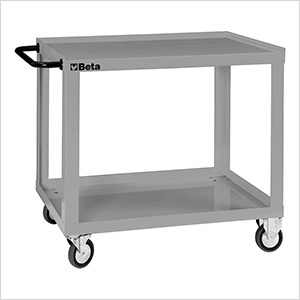 The Beta Tools 2-Shelf Shop Cart is a heavy-duty shop cart suitable for professional use. 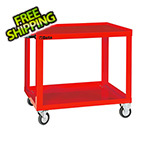 The welded construction and reinforced top allow the cart to hold up to 750 kg (over 1650 pounds). Four large-diameter casters (2 fixed and 2 swivel) plus a handle at one end allow great mobility. The two shelves each have a deep lip to prevent items from falling off.